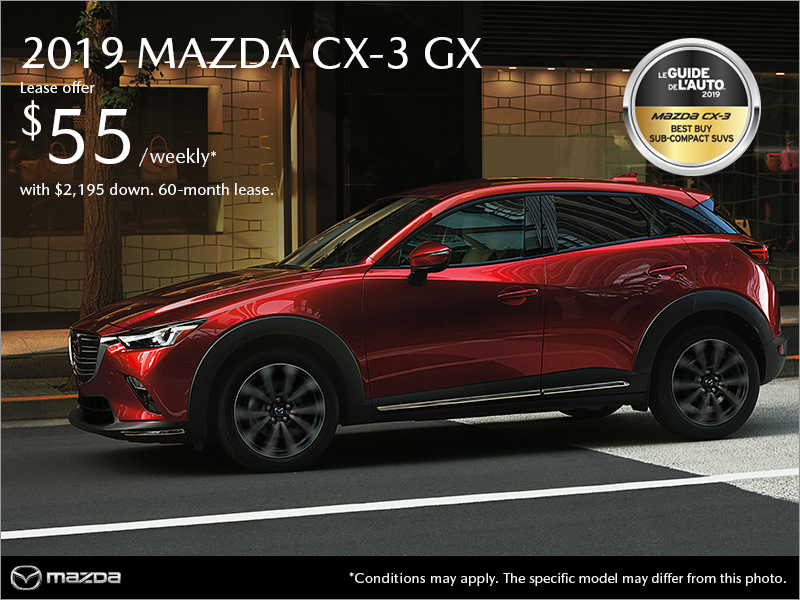 2019 Mazda CX-3 GX Deal in Montreal! 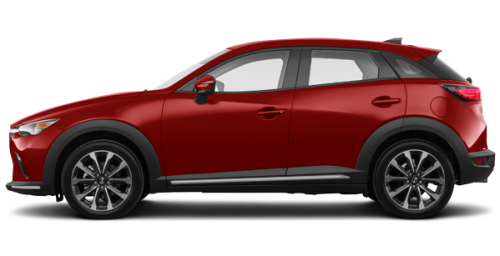 *Lease offer is based on the 2019 MAZDA CX-3 GX FWD (HVXK69 AA01) model, with 2L 4 cyl. engine and 6 speed Manual transmission. Lease selling price is $21,905.00. Lease payments includes rebates: Stackable Lease Cash ($1,000.00), DAA Lease ($344.93). Lease payments includes: Freight ($1,295.00), PDI ($600.00), Air conditioning excise tax ($100.00), Admin fee ($150.00), Tire Tax ($15.00). License, insurance, registration, additional options and applicable taxes are extra. Lease offer is based on a 60 months term and 2.49% interest rate. Weekly payments of $55.43 include $2,195.00 cash down. Lease offer is based on a 20000 km per year kilometreage plan. $0.08 fee per excess kilometer will apply. Lease offer on approved credit. Rates and requirements may vary depending on credit worthiness. The initial cash down does not include taxes. Options and accessories may vary by trim. Prices, payments and rates are subject to change without notice. Please validate the information with a sales representative. While every reasonable effort is made to ensure the accuracy of this information, we are not responsible for any errors or omissions contained on these pages. Please verify all information and pricing with a sales representative or ask online. Note: Initial cash down does not include taxes. Extra charges may apply if transmission is changed. All prices and payments are subject to price increase and/or rate changes without notice. Some conditions apply, see Spinelli Mazda for complete details.